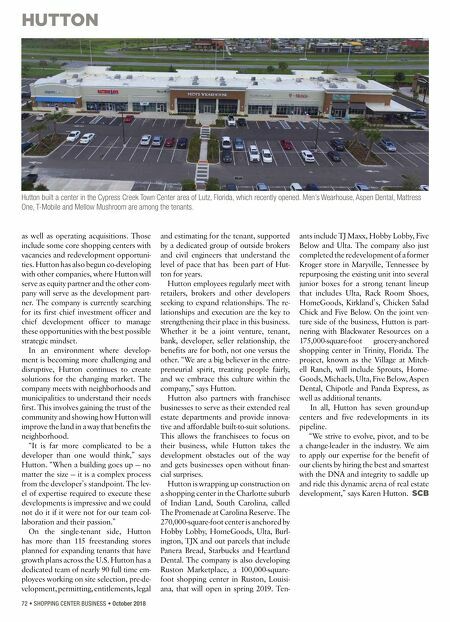 HUTTON 72 • SHOPPING CENTER BUSINESS • October 2018 as well as operating acquisitions. 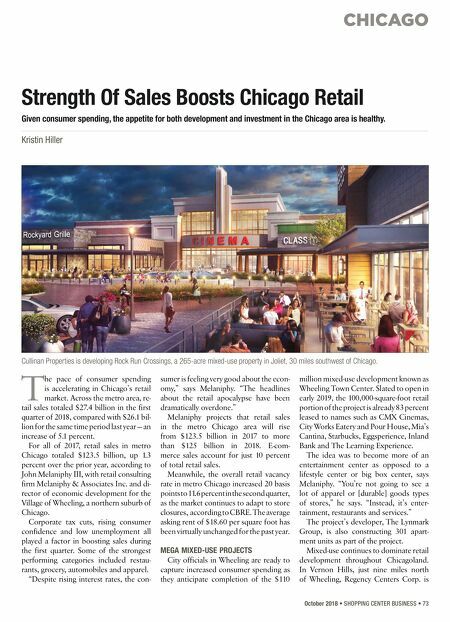 Those include some core shopping centers with vacancies and redevelopment opportuni- ties. Hutton has also begun co-developing with other companies, where Hutton will serve as equity partner and the other com- pany will serve as the development part- ner. The company is currently searching for its first chief investment officer and chief development officer to manage these opportunities with the best possible strategic mindset. In an environment where develop- ment is becoming more challenging and disruptive, Hutton continues to create solutions for the changing market. The company meets with neighborhoods and municipalities to understand their needs first. This involves gaining the trust of the community and showing how Hutton will improve the land in a way that benefits the neighborhood. "It is far more complicated to be a developer than one would think," says Hutton. "When a building goes up — no matter the size — it is a complex process from the developer's standpoint. The lev- el of expertise required to execute these developments is impressive and we could not do it if it were not for our team col- laboration and their passion." On the single-tenant side, Hutton has more than 115 freestanding stores planned for expanding tenants that have growth plans across the U.S. Hutton has a dedicated team of nearly 90 full time em- ployees working on site selection, pre-de- velopment, permitting, entitlements, legal and estimating for the tenant, supported by a dedicated group of outside brokers and civil engineers that understand the level of pace that has been part of Hut- ton for years. Hutton employees regularly meet with retailers, brokers and other developers seeking to expand relationships. The re- lationships and execution are the key to strengthening their place in this business. Whether it be a joint venture, tenant, bank, developer, seller relationship, the benefits are for both, not one versus the other. "We are a big believer in the entre- preneurial spirit, treating people fairly, and we embrace this culture within the company," says Hutton. Hutton also partners with franchisee businesses to serve as their extended real estate departments and provide innova- tive and affordable built-to-suit solutions. This allows the franchisees to focus on their business, while Hutton takes the development obstacles out of the way and gets businesses open without finan- cial surprises. Hutton is wrapping up construction on a shopping center in the Charlotte suburb of Indian Land, South Carolina, called The Promenade at Carolina Reserve. The 270,000-square-foot center is anchored by Hobby Lobby, HomeGoods, Ulta, Burl- ington, TJX and out parcels that include Panera Bread, Starbucks and Heartland Dental. The company is also developing Ruston Marketplace, a 100,000-square- foot shopping center in Ruston, Louisi- ana, that will open in spring 2019. Ten- ants include TJ Maxx, Hobby Lobby, Five Below and Ulta. The company also just completed the redevelopment of a former Kroger store in Maryville, Tennessee by repurposing the existing unit into several junior boxes for a strong tenant lineup that includes Ulta, Rack Room Shoes, HomeGoods, Kirkland's, Chicken Salad Chick and Five Below. On the joint ven- ture side of the business, Hutton is part- nering with Blackwater Resources on a 175,000-square-foot grocery-anchored shopping center in Trinity, Florida. The project, known as the Village at Mitch- ell Ranch, will include Sprouts, Home- Goods, Michaels, Ulta, Five Below, Aspen Dental, Chipotle and Panda Express, as well as additional tenants. In all, Hutton has seven ground-up centers and five redevelopments in its pipeline. "We strive to evolve, pivot, and to be a change-leader in the industry. We aim to apply our expertise for the benefit of our clients by hiring the best and smartest with the DNA and integrity to saddle up and ride this dynamic arena of real estate development," says Karen Hutton. SCB Hutton built a center in the Cypress Creek Town Center area of Lutz, Florida, which recently opened. Men's Wearhouse, Aspen Dental, Mattress One, T-Mobile and Mellow Mushroom are among the tenants.